Believe it or not, my family isn't totally obsessed with cats (we even have a dog), so we don't have lots of cat-themed books; just a few and I'd like to tell you what we like about them. These books have been particularly enjoyable. 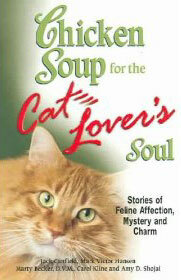 "Chicken Soup for the Cat Lover's Soul"
Firstly, my youngest daughter and I really enjoyed reading the touching and entertaining stories in Chicken Soup for the Cat Lover's Soul. I read one story at bedtime each night until we'd read them all. One of our favorites was a story about a three-legged cat that befriended a lonely third-grade girl and inspired her to overcome significant difficulties in her life. 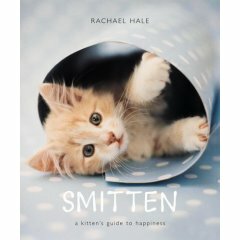 "Smitten: A Kitten's Guide to Happiness"
My family LOVE Rachael Hale's beautiful pet photography. She has a real gift and her books are wonderful. This is a great book to cheer up a sour mood (especially for kids), or to enjoy at any time. Rachael Hale has produced other photography books on cats and dogs and they all feature her alluring style.